This is the first book in the His Fair Assassins series. The scars on Ismae’s body mark her as something different, something to be feared. Leftover from the failed abortifacient taken by her mother before her birth, the scars also mark Ismae as a daughter not of a human man, but instead sired by St. Mortain, otherwise known as Death. The fear induced by her heritage keeps her safe – barely – from her turnip farming father, but enrages the man she is sold to in marriage, a man who promises to see her killed. Luckily, there are many who are still loyal to the old gods of Brittany, gods who must now be called saints to avoid conflict with the Catholic church and these priests and herbwives smuggle Ismae to the convent of St. Mortain. In the convent, Ismae becomes a handmaiden of Death, trained in the art of killing those marked by St. Mortain, those enemies of Brittany. Brittany has many enemies these days. The Duke is dead, and his daughter the Duchess Anne is only 12, although she is a wise and mature young woman. France is hungry to expand its borders and it seems that she must marry to ensure the safety of her country, but her most ardent suitor is a man not remotely suitable. Ismae, who grew up a peasant, finds herself sent to Anne’s court with a courtier and member of the Privy Council, Duval, to protect the Duchess and Brittany, and to ensure that Mortain’s will be done. LaFevers has created in Grave Mercy a wonderful and engaging world that is particularly effective for being set against true historical events, such as Anne’s ascension to the Duchy of Brittany, and the ensuing Franco-Breton War. Whether Brittany the veneration of ancient pagan gods as saints continued in 15th century Brittany I do not know, but LaFevers certainly made it ring true, particularly when setting this veneration against the close relationship between Brittany’s enemy France and the Pope. In addition, Ismae is an incredibly captivating heroine, naive and damaged at the same time she is brave and strong. Her reactions and emotions are entirely consistent with her character as LaFevers develops it. Perhaps best of all is the way that LaFevers ended this, the first book in the series. Although there is a question of what will happen in Anne and Ismae’s futures, the story that is being told is also completely wrapped up. 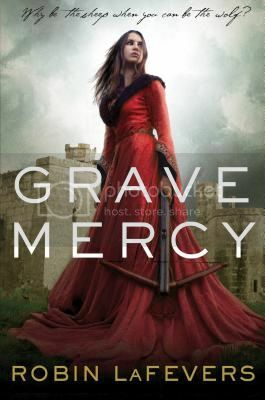 I would be thrilled to read about Ismae’s continuing adventures, or in learning more about some of the other girls from the convent, and yet Grave Mercy completely satisfies in and of itself. This series shows much promise, and I can’t wait for the next installment in 2013. Highly recommended.